Complete Ergonomic Assessments – Ergonomics refers to “the science of designing the workplace environment to fit the user”, by looking at the interaction between the person, their workplace and equipment. Research has found that many employees report suffering from neck, shoulder, upper back or lower back pain at some point in their working lives. The easiest way to minimize the risk of suffering a work-related injury is to ensure that your workplace is fitting properly. This includes having workstations designed and set-up as ergonomically as possible. 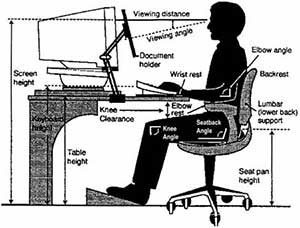 Employee workstations can be assessed on an individual basis and must take into account the persons height and body shape, the physical requirements of the task, and the frequency and duration.